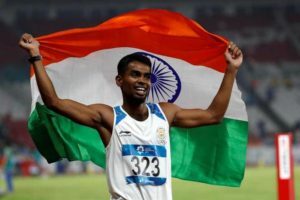 The 21-year-old athlete specializing in 400 metres and 400 metres hurdle started sports by playing kho kho till state level and then switched to athletics. He lost his father to tuberculosis at the mere age of 10 years. Since then, Dharun and his sister ( A volleyball state level player) have struggled a lot alongside their mother to make a living. In July 2016, Dharun was part of the national athletics competition held in Bangalore. The quartet team consisting Dharun, Mohammad Anas, Kunhu Muhammed and Arokia Rajiv created national records at the national 4×400 metres relay clocking at 3:00:91. The performance made the relay team jump to rank 13 in world rankings and India qualified for Olympics after 1964 and 2000. “I’m happy I could improve upon my performance of 49.45 in March, and to become the first Indian to run sub-49. I have been preparing for the Asian Games for the past one year and came here hoping to break the national record,” says Dharun after clinching the Silver at the Asian Games by a new national record timing of 48.96 seconds. Previously he celebrates Gold at 4×400 metres hurdles event in 2016 South Asian Games in Guwahati clocking at 50.54 seconds. Next articlePhotos: The Coco Ho Story.